First came Friday Night Yoga Club. Then came Adult & Kids Yoga (Summer Tuesdays). And now for summer announcement #3: Back to School Yoga Camp! Please join us from August 29 - 31 as Butterfly Kids Yoga takes yoga out of the studio and brings an amazing 3-day kids yoga camp to White Brook Nature Building & Area in Perinton, NY! 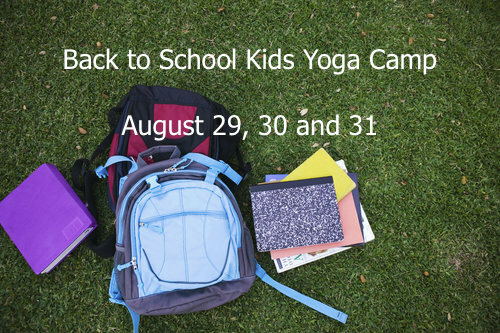 Back to School Kids Yoga Camp will feature active yoga, arts and crafts, yoga-themed games, journaling for older campers, teamwork & social skills, outside activities, and more. Geared for ages 5-8 and 8-12, kids will create new friendships and build lasting memories as we soak up the remaining days of summer and prep for the upcoming school year. Click here to enroll in just one camp day (ages 5-8). Click here to enroll in just one camp day (ages 8-12). Celebrate summer. Prep for school. See you at the Back to School Yoga Camp!